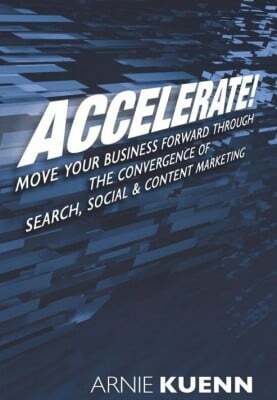 This is my video interview with Arnie Kuenn about his excellent new book Accelerate. It’s a playbook for integrating your social media, search, and content marketing. I wrote the forward for the book. Video transcription from Speechpad. Fast, easy, inexpensive. Arnie, thanks for joining me. How are you? Arnie: I’m doing great. I think we should end right there. Jay: That’s it. We’re done. We’re done. Thank you. Drive safely. Jay: How’s the book doing? Arnie: I think it’s doing pretty well. We came out of the gate with a pretty big promotion and managed to get ranked number one in our category the first week. It’s dipped a little bit since then, which is expected, but we’re out promoting it and I’m out speaking, and I’m sure the sales will stay smooth. Jay: Fantastic. Well, congratulations, I know that that’s not an easy task putting it together, and marketing’s not easy, so good for you. Jay: So the book is interesting because it actually is really one of the first books that talks very specifically about the holy trinity of search and content and social and how they work together. It’s a three-legged stool. You can’t really work without all of them. Tell me about that a little bit and how you got to that point. Jay: I was going to say, you still like her after she suggested that you write a book? That’s impressive. Arnie: Right, exactly. She still works here. But anyway, a year later we have a book. Jay: One of the things that I really appreciate about your book is that you’re very upfront about the notion that while companies need to create content, it can’t only be about themselves. You can’t just talk about your company and what you’re doing over and over, because you’re only so interesting. There’s a limit to what people will support. Can you elaborate on that a little bit? Arnie: Yeah, I think the line I use a lot is, “It’s not about you,” as the vendor. As the company, “It’s not about you. It’s about your customer.” I think when I’m out speaking what I try to remind people of is to think about when they’re online, and when they’re on Google, Facebook, whatever the platform is and they’re out searching for information, how are they searching? What are they looking for? It’s generally not to find out what company has won the most awards or has the most employees, but it’s you’re trying to find solutions to your problems. You’re trying to find information, things that are going to help decide to make that purchase or investigate whatever service a little bit further. That’s what I think people need to keep in mind when they’re creating the content, is keep that searcher in mind. Jay: When we talk about content, I think most people naturally go to the place of a written web page. Most people think about that as content in our world, but there are a lot of other places within your website that you can make a difference in terms of what you say and how you say it. One of the great examples that you use in the book is on eCommerce pages, that you can have a regular product detail page, or you can really use that as an opportunity to tell a story. I think Zappos is one of the examples that you use in the book. Arnie: Right. I think Zappos, REI, Amazon are some really good examples. I realize they’re big, big companies and people naturally assume they have the resources to do this. But I feel like, if you’re in eCommerce and whether you have 100 products to sell or 10,000 products to sell, you do need to tackle what you can tackle. If you can tackle ten product pages a month and really improve them by maybe adding user generated content in the form of reviews, or comments, or feedback, video if you could, a how-to video, how to install this or how to size this, or whatever. But whatever you can do to, again, help your potential customer feel very comfortable with making this purchase, I think that’s what you should focus on. What I see happen a lot, and we’ve all seen this, is where maybe you’re representing somebody else’s product and they give you a data feed and you just implement that data feed like a 1,000 other sites did. You’ve really gained no advantage. Jay: I’m glad you mentioned video in that answer as well. I’m a big believer in video content, obviously, and I think you are as well. You counsel your clients at Vertical Measures to create video content and that you make some video content for your clients. Do you think that makes a lot of sense for most companies and will continue to be a good tactic? Arnie: Yeah, absolutely. This is going to sound silly to say. I really believe in content for search, and this is the year of video. Jay: It’s always the year of video. They always say that, and mobile. It’s always the year of video and the year of mobile. Arnie: Theoretically if a video is optimized and done well, compared to any other piece of content, the odds of it showing up in the Google search results are 53 times greater than another piece of content. So that says something really, really powerful right there. Jay: It may be the year of the video or the year of mobile, but it seems like it’s also the year, or the couple of years, of infographics. I mean, everybody’s got themselves an infographic all of a sudden. I don’t remember infographics being this crazy a while back. You guys do a lot of search optimization. It must work, right, or people wouldn’t be doing it? Arnie: Well, it does work. Infographics are nice, relatively short pieces of content, sometimes they get pretty large, but a nice snapshot and a nice easy way to digest content. So therefore they gather links, which is pretty important for SEO. The content gets spread, so sometimes it’s going to be a pretty good viral thing. I will say, and this is just strictly my opinion, I think it’s getting a little bit oversaturated. But if it’s done well, it can still be really, really good content. Jay: Fantastic. Yeah, some of them I fell like, yeah, it’s a graphic, but it’s not necessarily info. It just gets a little bit . . . it doesn’t really convey that much, so it’s just a little bit lame. Obviously, there are other design considerations as well. Sometimes they’re really artfully done and really pretty and cool, and other times it’s not as good. Arnie: Yeah, exactly. If you create a good piece that doesn’t have those two detractors, then hopefully it will engage and work for people. If it doesn’t have data, like you mentioned, or any info in the graphic, then it’s probably not going to work. Jay: You talked about infographics being somewhat easy, at least in the last couple of years, to get people to link to. One of the things I love about your book is this notion of link attraction versus link building. Can you talk about the differences there and why they’re important for companies? Arnie: Yeah. That’s actually been quite an evolution at Vertical Measures. As I mentioned earlier, our roots pretty much are a link building SEO company, and five or six years ago, link building was much, much easier than it is today. We could reach out and just talk to people about maybe, not just necessarily link exchanges, but here’s an interesting site. I see you link to others, or maybe you would link to this one. We could get yeses pretty frequently, or where there are other ways to go out and get links. Today it’s much, much more difficult. Webmasters and website owners are much more savvy. They understand the value of links. So we’ve been kind of on this theme for the last 18 months to 2 years of trying to get our clients to understand it’s really about link attraction. The whole idea of link attraction, is just taking the time to produce a really nice piece of content that people will want to link to as a part of their whole editorial process on their end. Which of Your Children Do You Love Most? Jay: Social wasn’t even an option back years ago when I started doing SEO and things like that, and now in some ways it’s harder and in some ways it’s easier. When you think about the holy trinity of search and social and content, what I find is that companies say, “Okay, I believe you. I believe you that these three things work together and that these three things are important. Tell me which of these things we should do first?” How do you answer that question? Arnie: Yeah, that’s a good one. What the reality is, is probably everybody’s jumped into social first. Arnie: If I had my druthers, a totally clean slate, I would say you’ve got to get your content squared away first. Even if it means creating three, four, five, ten really rock solid pieces of content on your site so that you have something to go out and promote and direct people towards, that’s what I would do. Now I suppose there’s a case to be made for it’s got to start engaging and building followers and all that, and I think that’s true. I think in social media what you do want to be doing is providing good advice. But eventually, you do have to have something pretty rock solid on your end to direct people towards. Jay: How do you know if this kind of stuff is working? There’s a lot of – I don’t know about black box – but there’s a lot of stuff that you do in your business, that I do in my business, that other people do in the search, social, content triangle where they’re not really sure what it is that’s going on. How do you measure that? How do you put a report in front of a client that says, “Look, this is effective”? Arnie: Ultimately what we talk to our clients about is what is it that they want to measure? Do they want to measure their rankings, which hopefully less and less clients are interested in rankings and they’re more interested in traffic, and then hopefully quality traffic that’s converting and whatever a conversion might be. It might be a completed lead form. It might be the sale of a product or signing up for a service. Jay: Well, the book is amazing. One of the things I love about it is it’s very tactical, very practical, very do this and then do this. I think if you have an interest in this topic, and you should regardless of the size of your company, it’s a book that you will keep on your desk and you’ll have all kinds of flags in it like I do here to refer back to because I learned a lot myself. And, I wrote the forward! from the man Arnie Kuenn from Vertical Measures.